Here at Creative Decks Niagara we take proud of what we build. No job is to big or to small. A nice and well constructed deck can be one of the best areas to have a family meal, a party or to simply enjoy a glass of wine. At Creative Decks Niagara we are dedicated providing the best quality decks from design to finished product. We are a dedicated family run business to help make your outdoor living space a reality. 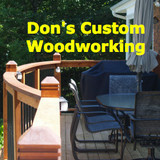 We build fences, decks , pergolas and sheds for homeowners. 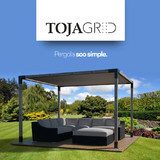 TOJAGRID is a unique pergola system that allows the DIY'er to build a sleek modern style pergola in their backyard in under an hour. This system will allow contractors and places of business to build shade for their spaces no matter the size in just a few hours. The best part about our product is the cost, check us out, find our for yourself! Builder of outdoor structures, decks,sheds, pool houses and custom decks in Barrie, Alliston, Innisfil, Tottenham ,Beaton, Newmarket, Alcona, Oro-Medonte, Springwater, Cookstown, Simcoe County as well as the Muskoka region. Green World Lumber Inc. is a hardwood lumber distributor that specializes in sustainable premium plantation grown Genuine Mahogany. At Zebra Deck we specialise in building stylish decks and working with you to design a deck to suit your budget. Servicing the Torontoe and GTA areas, we have 10 years experience in the building industry & offer competitive prices & free quotes. I'm a skilled carpenter with a passion for my work. I prefer to keep my business small and personal. I'm the one doing the work, with a helper, occasionally a third. We take pride in our work and hold ourselves to a high standard of craftsmanship. Aura knows that whether you're enjoying the quiet solitude of the morning sunrise, a romantic dinner for two or a lively get together, your deck has the ability to make that event feel even more special. Make your outdoor space just as luxurious and comfortable as a room inside your home. Aura decking is the superior choice to make your deck effortlessly picture-perfect. With a full line of colour matched finishing accessories, Aura Decking is a great product for any outdoor space including decks, porches, pool decks, cottage decks, docks and much more. Aura is not a composite product. Our decking is made from 100% Premium Polymer material, with no organic material, eliminating issues of mold, mildew rot and insects. The material will not fade, split, crack or warp and requires no staining, painting or sanding. This product is truly Ultra Low maintenance, leaving behind any tiresome annual maintenance, giving you more time to enjoy outdoor living. Designed and inspired by the beauty of real wood, Aura offers 3 natural wood colours: Cedar, Chestnut and Grey. Made with deep wood grain embossing for texture and colour variation, deck boards are made to resemble real stained wood. Installed with our revolutionary UltraClip hidden fastening system, Aura decking offers a fastener free surface to enjoy. Don’t compromise the look and feel of real wood with a decking surface that is satisfactory. Choose the option that is superior to the rest, a classic, natural look with all the benefits of modern low maintenance engineering, Aura Decking. Forest Grove Construction Ltd. has been in business since 1994. 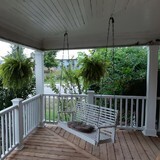 We are a small company specializing in exterior construction. Our reputation has grown exponentially over the years because we provide outstanding service and quality workmanship. 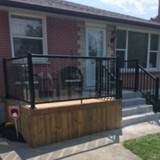 Since 1979 Flamborough Patio have been the leading designer, manufacturer and installer of outdoor structures, play centres, decks and cedar furniture in Southern Ontario. With over 2 acres of displays for you to view we do not ask you to choose from a brochure, you can see, touch and even smell the quality of our work. National Decking, Ipé wood decking and Composite: Trex, Azek, Fiberon, Timbertech decking with locations in Toronto (Ontario) and Montreal (Quebec) is The Decking mega store supplier for deck builders and home owners. We fabricate and distribute flexible outdoor deck tiles ideal for resurfacing condo balconies and flat roofs for any area. No nails or screws to install.